This particular knife was sold in the Available section in November 2012. This is a classic Sendero. The Sendero is the best overall using design I have made in a outdoors knife. The back of the handle is set up to where your pinky controls the tip of the knife when used edge down normal work, then in upsdie down use, which you will do a lot, it fits in the palm of your hande with your thumb on the sweep of the guard for again excellent control and function. If you ever use a Sendero you will never be without another. This one is a bit larger than I normally do, a bit thinner on the blade for easier slicing and weighs only 3 ounces. Easy to carry and just plain fun to use. In it's testing I was having fun cutting with it. The drop of the choil is a bit longer than I normally do so that there is room for the finger in front of the guard for choke up use. This particular knife will be shot for one of the major TV stations for Louisiana in the morning early [ they are coming up for a human interest story] then on it's way to Kenny Rowe for a sheath. In a normal year I do 3 maybe 5 sheep horn handles a year on various designs. This is only the second sheep horn this year. You are getting a one of one piece with this Sendero. It is also the first time I have done the Tail of Tears on a Sendero. First one to let me know gets it. 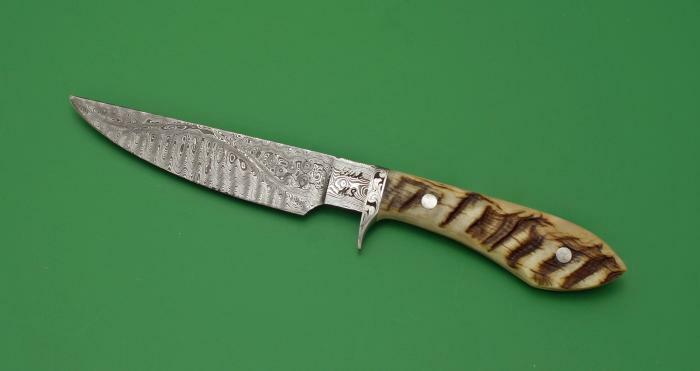 Blade Steel: Trail of Tears Damascus pattern.